The addition of a summary section at the top of this CV or Résumé template which is highlighted with soft grey shading provides you with the opportunity to summarise in just a few lines who you are, what you can do and what you're looking for. This is possibly the most important part of the CV or Résumé as it is the section that tends to catch a would-be employer's eye as they scan through the piles of applications they have received. Here, you can set out your job title, years of experience, highest qualification and desired position. Avoid fluffy words such as 'hard worker' 'works as part of a time' 'reliable' - you'll be able to offer real examples of these skills later on when writing your CV or Résumé but if you include them in your summary section, you'll find your CV or Résumé is quickly skipped over and ignored. Indented CV/Résumé template in Word format	Overall rating:	5	out of 5 based on 3	reviews. 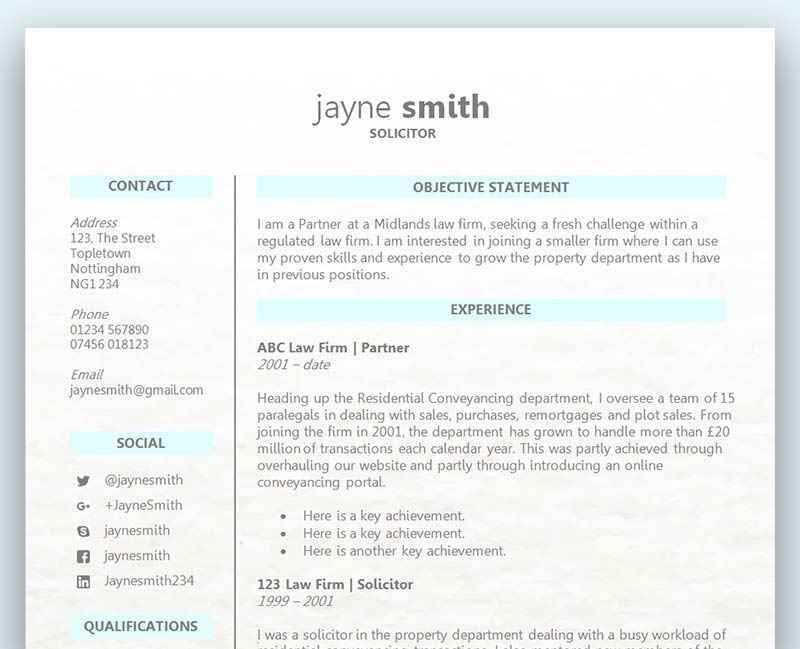 Our Indented CV/Résumé template is all about clean, good looks with very little fuss. This simple CV or Résumé template uses our favourite Garamond font and a very basic black and grey colour theme to arrange your information in a visually appealing way. Careful alignment splits up the headings from the information itself, making the template easy to read. We've also added a neat soft grey bar at the top and bottom of the page to 'frame' the page and give it a smarter and more finished appearance. The summary at the top of your CV or Résumé is your opportunity to catch your employer’s attention and interest, so use it to pack some punch. Keep it extremely factual and drop in any key achievements that you think would be of interest to prospective employers. AVOID FLUFFY WORDS IN THE SUMMARY – we cannot emphasise this enough, but so many candidates just don’t listen. While it may be true that you work well as part of a team, a prospective employer is not going to believe you based on what you’ve written. If you want to prove a particular soft skill, offer specific examples later in the CV or Résumé of how you have demonstrated that skill in a working environment. For example, if you are good at handling difficult customers, you could write “I worked in the complaints department of XYZ Holdings for 2 years. During that time I successfully resolved typically 100 – 200 complaints every week. Customer satisfaction scores in relation to the handling of my complaints were 97% positive.” As you can see, this is extremely specific – but it is an ideal example to show your prospective employer that genuinely, you are very good at dealing with difficult customers. You don’t need to include too much personal information on your CV or Résumé template – it’s irrelevant and it gives the employer an opportunity to discriminate against you before they have even met you. For example, it’s best not to mention that you’re married, have children, or what your age is. If during the job interview the employer asks a question such as the above and then does not hire you, and you do not think there was another good reason why they did not hire you, you should consult a solicitor as they may have discriminated against you. We hope you love our Indented CV or Résumé template and we’d welcome your feedback as always! I’ve just used this Cv template to send off about a zillion applications (ok, 34). It’s a great design. thanks for making it free.